New Delhi: Infosys Ltd’s chief executive, Salil Parekh, has reached out to investors to assuage concerns about a string of senior management exits, including that of chief financial officer M.D. Ranganath, assuring them that India’s second-largest software services company will strengthen its leadership team and contain attrition. Parekh, who took over as CEO in January, told some analysts that Infosys will hire people from outside to strengthen its account management, large deals and digital teams. “Mr. Parekh is looking to augment leadership through external hires in account management, large deals team and select digital competencies while interventions are under way to contain attrition," Kotak Institutional Equities analysts Kawaljeet Saluja and Jaykumar Doshi wrote in a 2 September note, after a meeting with Parekh. Last month, Ranganath, a veteran of nearly two decades at Infosys, abruptly resigned from his position, marking the third senior executive departure at the company under Parekh’s watch. Other than Ranganath, Infosys lost two other top leaders this year—president Rajesh Krishnamurthy and healthcare business head Sangita Singh. “Mr. 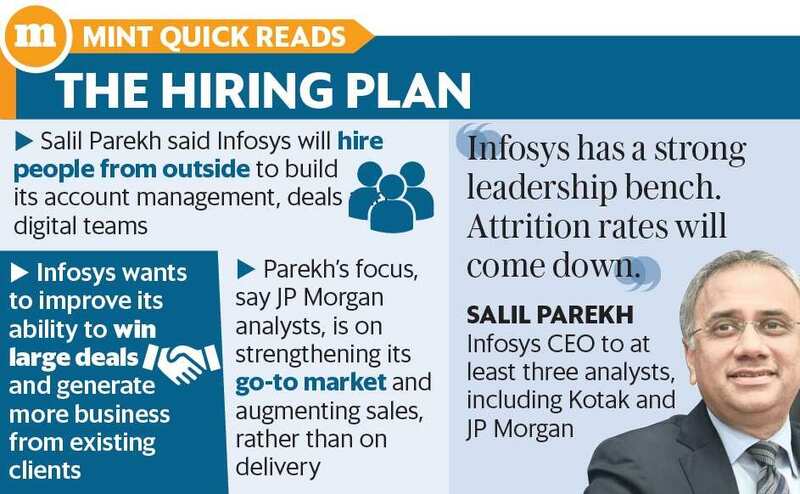 Parekh believes Infosys’s high attrition can be partly attributed to its strong training engine which makes employees an attractive target," the analysts wrote in the note. “Mr. Parekh expects attrition to decline in the coming quarters with multiple interventions kicking in, including: timely wage revisions, more promotions and better employee engagement." Parekh spoke with at least three equity analysts over the last week, according to an executive familiar with the development, as there was growing apprehension that Infosys is struggling to build a stable management team. “At our meeting with Infosys’s CEO/MD, Mr. Salil Parekh, we discussed investor concerns over the stability of the senior management team in the wake of the CFO’s recent resignation and the ability of Infosys to deal with such top-level departures," JP Morgan Chase and Co. analyst Viju George wrote in a note to investors on 2 September. “Our view — we received reassuring messages from the CEO on these and other aspects. Infosys has a very deep management bench as per Mr. Parekh, which should help the company deal capably with senior management departures; recent departures of business (vertical) heads and of the CFO should not have a business impact given the experience and relationships that leaders one level below bring to the table and their readiness/ability to step up as replacements." Infosys’s decision to boost its leadership team in account management and large deals reflects the company’s desire to improve the firm’s ability to win mega deals (more than $1 billion in value) and its ability to generate more business from existing customers. Infosys, which generated $10.94 billion in revenue in the year ended 31 March, expects to grow its revenue between 6% and 8% in constant currency terms in the current financial year. The company, however, lowered its profitability outlook to 22-24% for 2018-19, against 24-26% two years back, as it wants to plough back the savings to invest in digital technologies, the fuzzy umbrella term that companies use to classify revenue generated from areas generally classified as social, mobile, analytics, cloud computing and Internet of Things. Digital accounted for 25.5% or $2.79 billion of the software services company’s full-year revenue last year.